I read the Hobbit as a child, and I clearly remember the cover illustration. 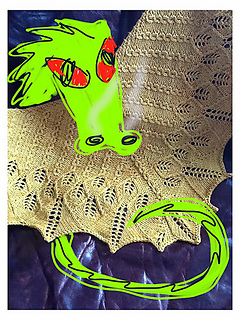 Smaug (the dragon) was coiled about his gold and he had one eye slitted open. 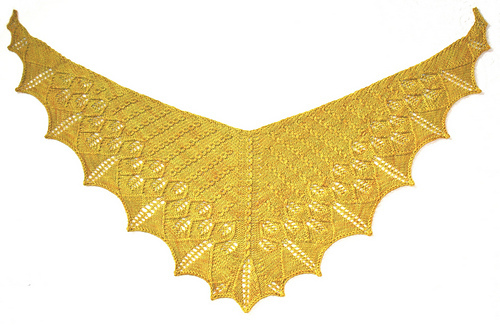 This shawl is inspired by that image – the cabled stitches form both stacks of coins and represent that narrowed eye. They transition into scales, and the edges and overall shape represent his wings, spread wide and darkening the sky. 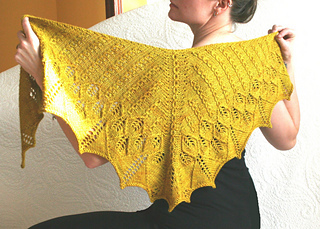 This is a more complex knit; the eyelet cables and patterning on every row couple with the rates of increase to create a shawl that is very balanced when complete, but not exactly predictable while knitting. But as with many quests, the treasure is worth the effort! 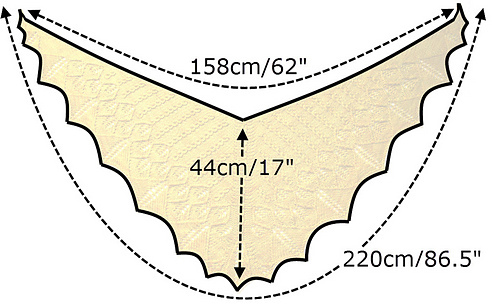 This pattern is both fully written and fully charted. It begins at the nape, and has greater rates of increase on the edges than at the center, which creates a broad and shallow triangle. Stitch counts are provided for every row, and the central spine and markers are bolded in the written instructions. The ‘coins’ have been written as cable instructions, though if you are familiar with working twisted stitches, you may find them quicker and easier to substitute. 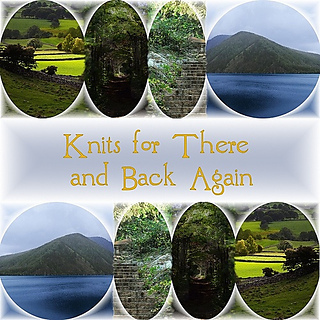 You will need around 365m/400yd of worsted weight yarn; each shawl used two skeins. It’s a lovely size - not too small for me (at 5’11, I’ve got a pretty decent wingspan myself), and not too big for the petite, either. From nape to point, it’s about 45cm/18”, and the inner wingspan is about 160cm/62”. Errata: In version 2.0, Chart F, R3 begins and ends with two kfb’s, and there should only be one kfb at the beginning and one at the end of the row. The written instructions in R3 - Section VI: Scales II are correct. Version 2.1 (and anything downloaded after Feb. 3 2013) has its chart corrected. Row 1 updated so that the center panel is bracketed on both sides by a p1, m1p, p1. Version 2.5 (and anything downloaded after Nov. 18, 2013) corrected a minor chart mislabel on pg8; would not create errors while knitting. R9: In the first repeating section, it should read “k2tog, p2, yo, k1, yo, p2, ssk, p3”. R10: Immediately following the bolded center stitches, it should read “k4, p1, k1, p1, k2, p1, k3” before leading to the repeating section. In Section VI, R5, the second repeat (after the center panel) should be repeated seven times. In Section VII, R5, the second repeat (after the center panel) should end with a “k3” not a “p3”. In Section VII, R5, the both repeats should end with a “p3” not a “k3”.